I came across the Becket Hitch while researching hammock styles for my book. At first I dismissed it as antiquated and not suited for modern hammocks, but it has since become my favorite way to connect a hammock suspension to an anchor point. It is simple enough to tie that even beginners are able to pick it up fairly quickly yet robust enough for veterans to use regularly. In addition to being easy to learn, it is light, requiring no extra hardware; it is simple, requiring no toggles or special alignment like the Marlinspike hitch; it is easily adjustable; it doesn’t bind; and it unties quickly. 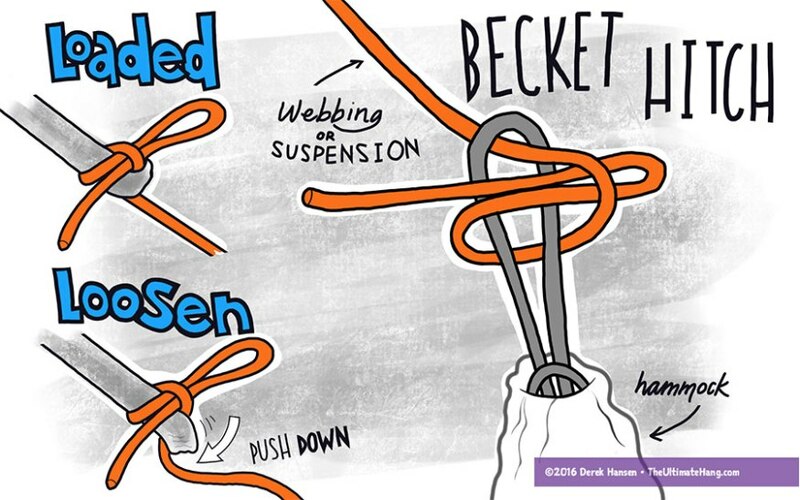 Scouters might recognize this as the Sheet Bend, but there is one subtle difference: a sheet bend takes a bend or loop created in the fabric where the Becket Hitch uses a fixed eye loop. This difference is why the Ashley Book of Knots distinguishes it with a different name, but they work the same. You can tie the Becket Hitch with rope or webbing, anchor side or hammock side, depending on how your hammock is configured. Where I find this works the best is with a long webbing strap that acts as both tree protection and suspension line. One word of caution: this hitch works best with webbing or sheathed rope. Certain combinations of thin or smooth cordage such as Amsteel, Spectra, or Dyneema are prone to slipping, although can hold with double or triple wraps, but this can make it harder to tie and untie, thus defeating the hitch’s usefulness. On your word of caution, do you mean that I’m fine if I use webbing to tie the Becket Hitch ONTO whoopie slings or a continuous loop but would have issues if tying the Becket Hitch USING amsteel? To clarify: If you have an Amsteel/Dyneema loop on your hammock, you can tie a Becket Hitch to it using webbing or a sheathed line and it will work fine. In my testing, using an Amsteel line to an Amsteel loop is a slippery combination. I’ve had luck making the Becket Hitch work in this situation with a TRIPLE wrap, but that sort of defeats some of the usefulness (and makes it more difficult to untie). In fact, using an Amsteel line to any sort of loop (webbing, sheathed rope, etc.) is not advisable. Webbing to an Amsteel loop works great. Sheathed rope to an Amsteel loop works great. Derek, I really appreciate you telling us about the Becket Hitch. I use a 15 foot length of 1″ tubular nylon webbing on each end of my hammock as both tree strap and suspension, and I connect it directly to a Dyneema loop on my hammock using the Becket Hitch. I weigh about 210 lbs. and the foot end of the hammock did fall with me one time. I tied the knot properly, but it slipped. So I have since placed a wooden 2/3″ dowel rod in the loop formed by the quick release of the hitch and this has worked fabulously. Sticks off the ground would work equally as well. It is still infinitely flexible as to hang adjustment and speed of connection and disconnection. Love it! I’ve used this knot ever since I saw it earlier on your website – now I have a more detailed explanation for my Scouts (thanks for that!). Specifically – I extend an Amsteel continuous loop on a ridgeline-just-a-smidge-too-short on my Turtledog. I used the lines that I replaced with Amsteel to do the extension (bowline one end to a carabiner, Becket on the loop). I do add one note of caution – I have never been able to make this hitch work with wrapped clew ends (all rope with no metal ring) – they seem to be too large and inflexible to hold the loop in place. For these, I end up with a chain solution as the best bet, since these types of hammocks aren’t very portable anyway. I use this on amsteel line to amsteel loop with the addition of a toggle. Before loading, place the toggle in the loop and pull the free end snug. No more slippage. There isn’t much load on the toggle, but it helps to remove it if it’s smooth as opposed to a found stick. For a couple of years now my go to hammock knot has been the ‘Slippery Larks Head,’ it’s fast a easy and very strong. I have noticed that for some reason my scouts struggle to mimic this knot. I will try the ‘Hammock Becket Hitch’ and see if they like that one better. Another one that’s stronger than the Larks Head, and is often used in climbing, is the clove hitch. I’ve used a slippery clove hitch often with my Hennessy when using hardware, such as a carabiner. * No hardware required. No carabiners or dutch clips, no whoopie hooks or toggles. * Superior flexibility. A real draw back with the whoopies is the ~3 ft of dead space on either end. Using just webbing allows you to get in really close to the tree. Using long webbing allows you to use bigger trees and/or trees farther apart. * Solid. Unlike a toggle, which in my experience is both fiddly and has a wont to twist out on you, the Becket Hitch isn’t going anywhere. * Fine grained. Unlike slap straps, you can dial this to exactly where you want it. * Inexpensive. ~10 USD for a pair. * All in one. You’re going to need webbing anyway. * Increased bulk compared to whoopies and a shorter length of webbing. * Adjustibility not as easily dialed in as whoopies after the fact. With whoopies you can hook in and easily adjust both sides in a very fine grained fashion. The becket hitch requires you to accurately estimate one side. With practice this downside is minimized. * Beginner ease of use. While I make using this hitch look easy, it’s not as easy for beginners to use as cinch buckles or whoopies. This goes away with practice. Overall, this is the best solution I’ve found. Really thankful you have shared this. I HATE the Hennessey Lashing for all the obvious reasons and this is perfect for instances where one doesn’t want to bother changing the suspension. The Blake’s Hitch is a friction hitch commonly used by arborists and tree climbers as an ascending knot. A Blake hitch? Isn’t that like a prusik? That sort of sliding knot won’t hold on smaller diameter line or slippery line like Amsteel. Do you find water travelling down towards hammock when using Mule tape. It certainly is possible. Add a drip line. Was that mule tape you used for the loop? Could mule tape used for the loop to gather the ends of a hammock? 5’6″ 185 lbs and I know not to use as tree straps not wide enough. Yes. Mule tape can be used for end loops and suspension. AntigravityGear uses a thinner 1/2 inch mule tape for their suspension, coupled with a wider webbing for the tree. Changed to the Becket Hitch setup in the house and like it a lot better than the whoopie I had. Redid the whoopies into continuous loops and I had a lot of mule tape so zero cost. Thanks for the info. Where would you put your water break in this system? One purpose of the HL is to prevent point-loading on ropes (according to the Hennessy website). Doesn’t the BH point load the suspension rope? Given that there is only one or two wraps around the webbing loop? What is your experience on the wear of ropes with the BH? In my experience the Becket Hitch wears better than the lashing for one main reason: it doesn’t move. The lashing is wrapped around itself and when you load the hammock it slips slightly. I’ve experienced melting on the rope and webbing loops as a result. This is normal wear, but because it happens often on the same point of the loop it gets more pronounced. The Becket Hitch can slip on dyneema so I don’t recommend that. Long webbing is my preferred method. Weight for weight, they are up to 15 times stronger than steel and up to 40% stronger than Kevlar© (DuPont). Being slender for their strength, they offer less bulk than other types of line. They are more abrasion resistant than high carbon steel. They are resistant to UV light. They do not absorb water (and they float). Now, while cordage made from Dyneema/Spectra/Amsteel doesn’t knot well, webbing straps work much better. Typically we splice Dyneema/Spectra/Amsteel cordage. When tying the Becket Hitch with a Dyneema cord against a Dyneema end loop, it has a higher probability of slipping out. However, if you have a Dyneema cord end loop and a Dyneema webbing suspension line, that would work with a Becket Hitch. The differing sizes help the hitch to hold. Excellent and thorough response. I look forward to your review of Dyneema 2.0 straps once you get some to review. First, will you use the straps also as tree webbing, or just the suspension. For example, you could use cheap 1.5 inch webbing around the tree that is attached to thinner webbing as the suspension. This is how the Antigravity Gear straps are made and they are fantastic and light. I highly recommend them for what you are doing. The Kevlar straps are nice but I don’t know if the weight and strength is really justified for the weight. Either way you go, you need to know what is the typical size tree you will hang on and what length of strap will I need to match the circumference and have some left over for suspension. A common length for this all-in-one approach is 8-10 feet. You can go shorter if your hangs allow it. I think with kevlar I might get one long strap for both tree strap and suspension. Muletape would be paired with a tree strap. I’m trying to go as light as possible, but your suggestion from antigravitygear is obviously better priced at 20 bucks weighing in at 4oz. 10′ straps of Kevlar 2.2 would cost the double, but only weigh 1.6oz. But you would still recommend the antigravitygear for durability and strength? I found the AGG suspension too long so I trimmed it. I got it under 2 oz. I don’t think you’ll need the extra strength of the Kevlar. Quick question. I been thinking about this set up and wonder if it will be too slippery. 1)regular poly tree straps to tree. On end loop is a loop to loop connection of Amsteel which is now essentially becomes a single line Amsteel rope off the tree strap. I have Amsteel continuous loops on my hammock. So what I would like to do is use a marlin spike hitch with a biner on the single stand Amsteel rope connecting the Amsteel suspension line to the continuous loop. Would the Amsteel be too slippery for the hitch or should this hold. I am going to try however just wonder your opinion. I hope I understand correctly. Tying webbing to the Amsteel loop will work fine. Tying Amsteel to Amsteel is not good. Awesome Vid! What knot was used to tie the white webbing to the ring? The loop on the wall? That’s just a Lark’s Head knot.